Since becoming Alderman in April 2016, Alderman Sophia King has led the 4th Ward with transparency, a focus on service, and as a voice for those who have historically lacked a champion in City Hall. Life experiences have guided Alderman King’s dedication to providing real opportunity for all residents of the 4th Ward, and to the City of Chicago. Sophia grew up in Evanston, Illinois. Her family hails from the Mississippi Delta, so as a child and young adult, she spent considerable time in the state. After her mother was extended the opportunity to attend Northwestern University in Evanston, the family relocated to the Chicago area. By example, her mother’s path demonstrated the value of education, hard work and how the power of opportunity can impact one’s life trajectory. As she matured, Sophia never disconnected from her roots or from those who instilled the value of family and of relationships, and she came to appreciate that a happy life is not defined by monetary accomplishments. These values took root during a diverse upbringing which included attending schools in Evanston, Illinois and in Jackson, Mississippi, and through spending summers in the Mississippi Delta. Her mantra and life-lessons are: that happiness should be the true barometer of one’s success; to judge people by the content of their character; that everyone puts their pants on, one leg at a time. As a result, Sophia has served her community over the years in a variety of capacities, particularly as an advocate for parity in opportunity and resources. Professionally, Sophia has been instrumental to opening doors of educational opportunity within her immediate (and greater) Chicago community. Through her work at the Latin School of Chicago, she was driven to help found the Ariel Community Academy — established to provide North Kenwood-Oakland residents with the same quality education that her students at Latin received. Further, Sophia utilized her Master’s Degree in Education and Social Policy from Northwestern University to diversify classes at the Latin School and promote Co-Curricular education at Chicago Public Schools. During the five years Sophia spent as a small business owner in the 4th Ward, she gained a unique perspective about the importance of small businesses to a community. Her insights about the challenges that face a new company motivated her to become an advocate, collaborating with government as a tool to help community-based businesses. Sophia has stimulated job opportunities for young people and for many in need, and as a result of that strong drive and focus, she has become a strong advocate for growing minority businesses and fair DBE representation in City contracts. The mission of Harriet’s Daughters, a not-for-profit organization that was founded by Sophia, was to increase employment and wealth in the African American community. 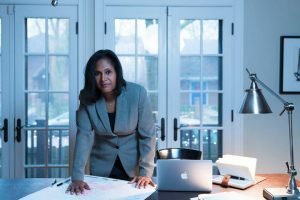 She and her organization worked with elected officials and individuals in leadership positions to turn a spotlight on disparities, and to enable access to jobs and procurement opportunities. In her surrounding community, Sophia has actively connected its variety of residents to address some of the largest problems in the City. Whether fighting for youth programs as President of the Kenwood Park Advisory Council, advocating for women’s reproductive rights as Vice President of Planned Parenthood Chicago, creating a community response to gun violence with The It’s Time Organization (TITO), or educating and empowering African-American women and businesses with Harriet’s Daughters by advocating for more inclusion in City and State contracts, Sophia has skillfully brought people together and engaged them in productive dialog to address complex challenges. She has continued to use this talent during her tenure as Alderman. On a personal note, Sophia King has been married for 27 years to prominent attorney and Chosen Few DJ, Alan King, and she has been the primary organizer of the Chosen Few annual music festivals. The Kings are proud parents of two adult daughters, and are members of a large and extended family. She enjoys family gatherings, walking the neighborhood, and playing a mean game of Bid Whist.